The US Masters, more commonly referred to as simply the Masters, is in many people’s eyes the most prestigious golf tournament of all and attracts extensive betting interest right around the world. There is something extraordinary about the Augusta National course. It is on the bucket lists of many golfers and golf fans just to visit for the Masters tournament, let alone hack a few divots out of the hallowed turf. Unless you are one of the best players in the world or a club member or great friends with a member, it is nigh on impossible to get a round at Augusta National. So for most we can probably rule out driving down Magnolia Lane with the clubs in the trunk. The next best thing might be finding the winner of the Masters, and the good news is it is probably the best major golf tournament to bet on. This article will run you through everything you need to know about betting on the US Masters, including bet tips, the tournament history and why Augusta has put many talented golfers back in their place. Who is hot: Rory McIlroy won the recent Players Championship and sits at the top of most sportsbooks’ markets for this year’s title. Dustin Johnson has returned to the top of the world golf rankings, but some believe his left-to-right ball flight is not well suited to Augusta. 281: Tony Finau, Dustin Johnson. When betting on the US Masters, there are several reasons it’s easier to find the winner of that garish green jacket than of any of the other big events, but the main one is obvious: the Masters is only major tournament played at the same course every year. While the US Open. 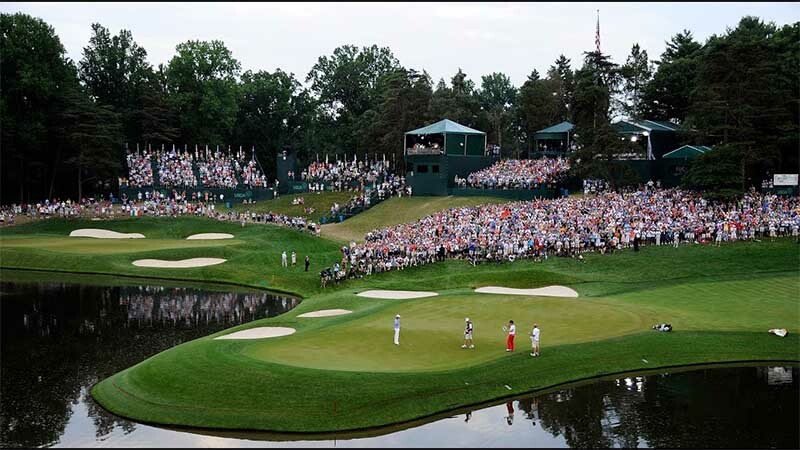 US PGA Championship and British Open rotate each year, the Masters is always played at the beautiful and exclusive Augusta National Golf Club. That alone means there are players with certain attributes who almost always perform well there. To find a contender you can often simply look back through the results from the previous few years and take note of who has done well, or who has shot the best score of the week. Augusta National is a unique course; every time you watch the tournament coverage on television the commentators will repeatedly comment that TV cameras do not clearly portray just how severe some of the slopes on fairways and greens can be. This means players really need great course management to do well, and often players who have not played the course under tournament conditions take a couple of years to find their best games at Augusta. Also, you won’t find many dodgy putters winning a green jacket. On the large and sloping Augusta greens the ability to avoid three-putts is paramount. Even more so than at regular PGA tour events, this tournament is decided on the greens. Finally, there is no qualifying tournament for the Masters and it has the smallest field of any of the majors, with some of those entrants with little to no hope. It is an invitational event with former champions given a lifetime exemption to participate. Most of these old-timers have little to no chance, although their participation is just one of the many factors that make the Masters great. Players who have done well at the venue before tend to do so again. So for some players you can ignore a recent run of ordinary form and go by their form at Augusta National. Something about the place gets the juices flowing for certain players and they seem to wind up on the leaderboard regularly. This is a course for great putters. Some greens have extremes slopes and they are often lightning quick. The trick is to keep three-putts off the card, but that’s easier said than done. Since the turn of the century, left-handers have won way more than their share of green jackets, with Mike Weir (2003), Phil Mickelson (2004, 2006, 2010) and Bubba Watson (2012, 2014) winning six titles between them. Lefties seem ideally suited to the course. Though it is so highly regarded, the Masters is a mere pup alongside the ancient British Open. It began in 1934 at the behest of Clifford Roberts and Bobby Jones. Jones designed and financed the course specifically to host the invitational and he hoped it would become a massive golfing event. The first Augusta National Invitational was held on March 22, 1934, and won by American Horton Smith. In the early years it was a low-key event but in 1939 the tournament’s name was changed to the Masters Tournament and more top-class players were included. From those beginnings the Masters has flourished to the point where it has millions in prizemoney, the best players in the world and unmatched mystique. The iconic green jacket was introduced in 1949, with the great Sam Snead the first to wear it. First-time winners get to take the jacket home for a year, after which they must return it to the Augusta National clubhouse. They then can wear it at Augusta, most notably at the champions’ dinner. A multiple winner of the event will receive the same green jacket they initially won. So one green jacket per champion, although if their measurements change drastically they can have a new one tailored. Also, the Masters committee, at its discretion, can also invite international players not otherwise qualified. Under this tradition past Masters champions gather for a meal on the Tuesday night before the tournament. This began in 1952, at the behest of the great Ben Hogan. The change which now allows the previous year’s Masters winner to set the menu for the Masters Club did not come into play until the mid 1980s. Note, the champion providing the menu also has to pay for whatever delicacies they decide upon, though with a Masters winner’s cheque now around $US2 million that should not be much of a stretch! And if whatever the champ decides on is not to the taste of everyone they can still choose from the extensive menu on offer at Augusta National. I mean, haggis as offered by Sandy Lyle is certainly not to everyone’s taste. Here is an edited list of what some of the past champions have served up to their green-jacketed brethren. Patrick Reed, 2019: Caesar salad. Bone-in ribeye, with macaroni and cheese, creamed spinach, creamed corn. Sergio Garcia, 2018: Arroz caldoso de bogavante (Spanish lobster rice). Desert: Tres leches cake, with tres leches ice-cream. Danny Willett, 2017: Mini cottage pies, Sunday roast (prime rib, roasted potatoes and vegetables, Yorkshire pudding). Dessert: Apple crumble with custard. Jordan Spieth, 2016: Salad, Texas barbecue (beef brisket, smoked chicken, pork ribs); sides of BBQ baked beans, bacon and chive potato salad, sauteed green beans, grilled zucchini, roasted yellow squash. Dessert: Warm chocolate chip cookie, ice-cream. Bubba Watson, 2015: Same as 2013. Adam Scott, 2014: Surf-and-turf. Calamari entrée. Australian Wagyu beef, with Moreton Bay bugs (lobster). Dessert: Strawberry and passionfruit pavlova, Anzac biscuit. Bubba Watson, 2013: Caesar salad. Grilled chicken breast with green beans, mashed potatoes, corn, macaroni and cheese, cornbread. Dessert: Confetti cake and ice-cream. Charl Schwartzel, 2012: Chilled seafood bar to start. Then braai, a South African barbecue, of lamb chops, steaks and South African sausages. Dessert: Vanilla ice-cream sundae. 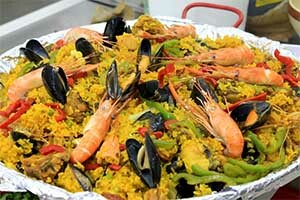 Phil Mickelson, 2011: Seafood paella and machango-topped filet mignon. Dessert: Ice-cream-topped apple empanada. Angel Cabrera, 2010: Argentine asado, a barbecue featuring chorizo, blood sausage, short ribs, beef filets and mollejas. Trevor Immelman, 2009: Bobotie (African spiced minced meat pie with an egg topping), sosaties (chicken), spinach salad, milk tart and South African wines. Zach Johnson, 2008: Iowa beef, Florida shrimp. Phil Mickelson, 2007: Barbecued ribs, chicken, sausage and pulled pork, with coleslaw. Tiger Woods, 2006: Stuffed jalapeno and quesadilla appetisers. Green salad and steak and cjicken fajitas. Mexican rice and refried beans. Dessert: Apple pie and ice-cream. Phil Mickelson, 2005: Lobster ravioli in tomato cream sauce. Caesar salad and garlic bread. Mike Weir, 2004: Elk, wild boar, Arctic char, Canadian beer. Tiger Woods, 2003: Porterhouse steak, chicken and sushi. Dessert: Chocolate truffle cake. Tiger Woods, 2002: Porterhouse steak, chicken and sushi. Vijay Singh, 2001: Seafood tom kah. Chicken panang curry, baked sea scallops with garlic sauce, rack of lamb with kari sauce, Chilean sea bass. Dessert: Lychee sorbet. Jose Maria Olazabal, 2000: Tapas table. Solomillo de buey salsa bordelesa. Broiled grouper, grilled lamb chop, broiled chicken. Dessert: Double chocolate cake. Mark O’Meara, 1999: Chicken and steak fajitas, sushi, tuna sashimi. Tiger Woods, 1998: Cheeseburgers, fries, milkshakes. Nick Faldo, 1997: Fish and chips, tomato soup. Ben Crenshaw, 1996: Texas barbecue. Jose Maria Olazabal, 1995: Paella and hake, plus tapas. Bernhard Langer, 1994: Turkey and dressing. Desert: Black forest torte. Fred Couples, 1993: Chicken cacciatore with spaghetti. Ian Woosnam, 1992: Leek and potato soup. Leg of lamb with sweet meadow hay. Dessert: Apple pie and ice-cream. Sandy Lyle, 1989: Haggis, mashed potatoes, mashed turnips. Larry Mize, 1988: Steak. Dessert: Peach cobbler. Jack Nicklaus, 1987: Shrimp cocktail. African lobster tails, New York steak, chicken and fish. Dessert: Black forest, pound and cheese cake. Ice-cream. Bernhard Langer, 1986: Wiener schnitzel, black forest cake.